As customers use workflows, they’ve been telling us about some improvements they’d like to see. We’ve made a few changes with more on the way soon. We’ve added some shortcuts to the top for the most common searches. Click on “Recent” and you’ll now see a list of items that are pending for you to take action, forms/workflows that you have saved as well as workflows that you have recently participated in so that you can quickly check the status of, say, a pending Leave Approval request. This is the most commonly requested item. 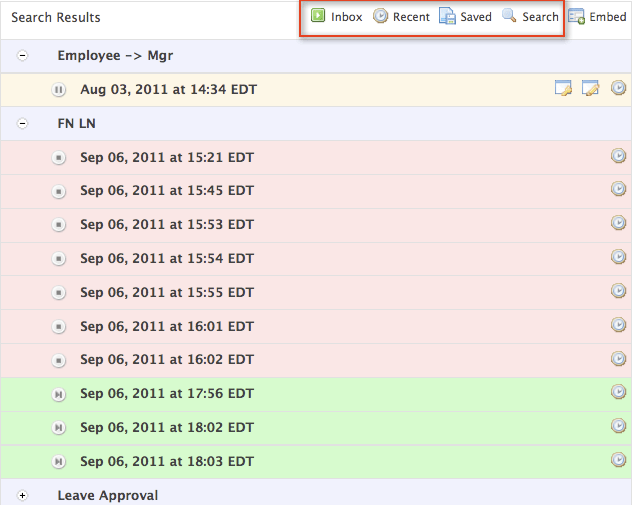 Click on “Saved” and you’ll see a list of forms & workflows that you have saved and are waiting for completion. With one click, you can now discard saved forms that you are no longer interested in. Tasks on your task list are also color-coded so it’s easy to see the status of a task: red ones are aborted, green ones are submitted and amber ones are pending. Saved searches. You’ll be able to search for tasks using certain criteria and save a shortcut that you can reuse in the future. View other people’s tasks. Today, you can only view a task if it is pending for you or if you have participated in the corresponding workflow. But, that’s usually not enough. Maybe there are a dozen Leave Approval processes pending throughout the company and HR wants to view the status of all of them. Read-only view of the current state. It’s like a paper form moving through the organization. I know it’s waiting for someone else to take action but I’d like to view the current state. Any more ideas? We’d love to hear them.